this was a huge tbc project for me in the last couple of weeks. Many hours have gone into adding hundreds of tbc outland quests. 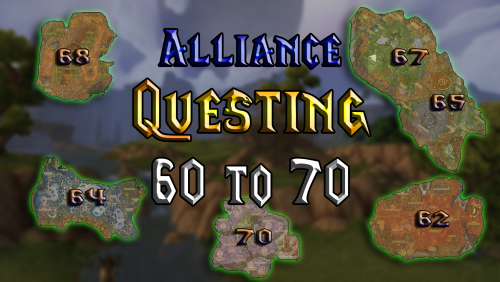 I hope you enjoy the 60 to 70 questing profile. Due to the insane amount of work, I do not offer a demo version. I will upload a video showcasing the first moments soon. Hellfire Peninsula, Zangarmarshs, Terrokkar, Nagrand and more! Bugfree TBC Questing! Reminder: You can use my Alliance 1 to 70 Grinder to get to 60 and then start the 60 to 70 quester from anywhere on azeroth! Level 60 to 70 support for TBC! Bugfree questing and efficient randomized backup grinding! Quest Reward choosing depending on your class! Launcher System to detect your location/level/quests and send you to the right spot! Automated Updates! The Profile updates itself on every start. Never download each new version again! Your Bot will set Hearthstones and actually attempt to use them to save time! Copy the launcher and the folder into your wrobot quester folder! Your bot needs to be level 60 and can either be in Kalimdor or in Eastern Kingdoms. Have been using this for 2 days now. It was released 3 days ago roughly. Can say I had some minor hiccups, but it was quickly resolved in Bambo's discord channel. The bot does quest, if your server is messed up and you don't complete a certain level the profile will grind abit in order to move to next zone. Doesn't matter where in outlands you are, just boot next profile and you're good to go. 5/5 no regrets in using this profile. Hello, thanks for your kind review. Please always boot the launcher file named "TBC_Quester_Alliance.xml". Great profile, best I've tried so far for 60 to 70. Bambo is also very fast in fixing Bugs. So far i made it to 66 without any trouble.